evoluzination: Do entangled particles communicate faster than the speed of light? Do entangled particles communicate faster than the speed of light? Finally I understood a little more about the entangled particles mystery. Entangled particles are two particles that being created together remain somehow linked in a way that while a given property is not determined in either particle, the resolution of this ambiguity will occur at the same time in both particles. There are two possible explanations for this observation. 1. 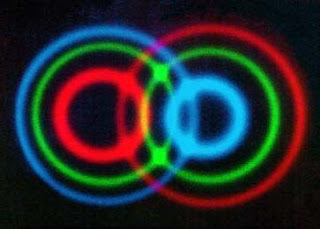 The two particles are indeed entangled as their name suggests and they can send information to each other faster than the speed of light, this way when one faces the decision the other gets communicated this decision and does the same thing. This is by far the most interesting explanation as there could be ways to use this faster than the speed of light transmission. The more I think about it, the more unlikely this seems to be true ... Why would one particle have to make the decision first than the other and the second one be just a listener? Would the transmitter/listener role be just set by time? Meaning the first one particle to reach the glass plate is the one that decides and then the second one just listens? Unless they just talk to each other and decide together in a two way faster than the speed of light communication? I'm not sure I understand the 100% of the experiment, but I guess it'd be interesting to delay the moment in which one of the two particles reaches the glass plate and see if still the correlation happens. Unless the time is key for the particles to know the event is related and they need to react the same. great ocean of truth lay all undiscovered before me." I'm not sure I understand the experiment so well, either... but the second explanation, although less exciting, seems more plausible. That reminds me about one of science's foundations, which is that science, by definition, is determinist (which means that everything, even something seemly so random as the exact position of a pen after falling from a table, can be accurately determined given all the relevant variables). That, by itself, should ruled out every explanation including "random" (paraphrasing Einstein: God does not play dice with the universe). So, probably they "made the same decision" because of some relevant variable we don't know, or can't measure yet. Also, the experiment only shows a boolean decision (to bounce or not to bounce), it should be interesting to see what happends with something that has more than only two options. Anyway, what you menction in the last paragraph is still true. We are learning, but we still know very little about the universe. I tend to think that Einstein's phrase is true too, although there are many examples of random stuff in nature such as Brownian motion in particles (biophysics) and random genetic mutations (at molecular level) driving the natural selection process. New payment method: It's up to you!